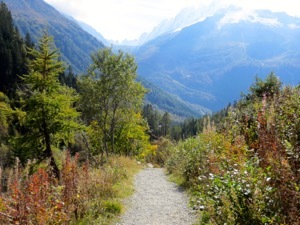 A lovely nature reserve with fabulous views of Mont Blanc and other peaks. The Réserve Naturelle des Aiguilles Rouges, or Red Peaks, refers to a nature reserve in the pre-Alps, just opposite Mont Blanc. The rocks in this area are metamorphic and contain a lot of iron, giving them the reddish color reflected in their name. The Reserve includes Mont Brévent in the south and runs almost to Vallorcine in the north. Access is just north of the small town of Argientière, which is just about 9 kilometers (5.5 miles) from Chamonix. The reserve covers over 8 acres of land, with lots of hiking trails. The Association des Réserves Naturelles des Aiguilles Rouges operates a small visitors' center and sells a guide to a short ecology trail that leaves from the center. This relatively easy walk is in the area of the Aiguilles Rouges best known for its diverse plant life. The walk is marked with 16 bornes or trail markers. You can buy a booklet (in French) that explains the various plants you are seeing. Although the visitors' center says the trail is one kilometer, it felt closer to a mile. It is relatively level and an easy walk with lovely views of the mountains, in addition to the flora. Above, Hiking trail in the Aiguilles Rouges.